Since 2000, USA SPIRIT Martial Arts Academy has been providing instruction in Taekwondo and the Martial arts in the Metro Chicago, IL area. We hope you enjoy our website and will stop by and visit us if you are in the area. This site is designed to give you information about our facility's our style of martial arts, our staff and provide you with information on how to contact us as well.Students should monitor this site to keep you informed on specific activities. Students that want to receive general e-mails from our staff can register as prospects and we will convert that info to A Student and you will automatically be sent event info. Taekwondo is primarily a kicking art, often with a greater emphasis on the sport aspect of the art. Taekwondo stylists tend to fight at an extended range, and keep opponents away with their feet. It is a hard/soft, external, fairly linear style and is known for being very powerful. There is a lot of competition work in many dojongs. Training tends to emphasize sparring, but has forms, and the basics are important as well.Our Students are not required to Compete or engage in Full contact Sparring But as a part of there Traditional Training Learn The techniques involved. 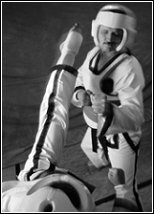 What cannot be over-emphasized in TAEKWONDO training is that it is a Philosophy and Oriental values rather than simple techniques and skills. Throughout your training one will be taught to maintain composure, sacrifice,modesty and Generosity based upon self-confidence. We are confident that these mental and moral aspects of TAEKWONDO will contribute to the contemporary world of industrialzation more than ever, as our society moves even more towards materialism, individualism and Moral decline. TAEKWONDO transforms one's character into a strong,resiliant SPIRIT so that one can develop leadership to guide and lead in all aspects of life. Leadership and a strong fighting Spirit provide confidence in all areas of a practitioners life so to help in maintaining composure and security, which will create patience and modesty. A Practitioner will also understand self Sacrifice,and giving , then will gain superior character as a leader of Society. Our only battle in this Life is Spiritual. We must stay connected to that Great Spirit that wants us to succeed and be Blessed and not to that Negative Spirit that wants to Destroy us and Tell us we can't make our Dreams come true. To SERVE the Community by Improving the Quality of Life for all who Embrace our "SPIRIT OF LOVE"